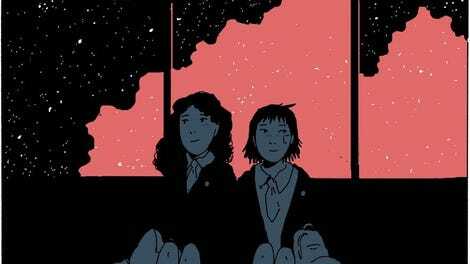 If you’re unfamiliar with the name Tillie Walden because you stick to the cape-and-cowl side of the comic shop, you’re missing out on one of the most increasingly popular and well-regarded names in the comics industry. Now just 22 years old, Walden was one of the youngest-ever Eisner winners when she earned the prodigious comics award for last year’s Spinning, an autobiographical graphic novel in which she explored her relationship with professional figure skating. In three short years Walden’s published four books, and expectations for her latest, On A Sunbeam (First Second), are undeniably high. Fans of Walden’s work will be happy and unsurprised to learn that the book lives up to Walden’s reputation. On A Sunbeam started as a webcomic, and was nominated for an Eisner in 2017, so there are pages and characters that some readers may already be familiar with. The book is well over 500 pages, heavy and satisfying to flip through. Walden usually works with limited color palettes, and On A Sunbeam is no exception. Two alternating timelines are washed in blue and purple respectively, with amber yellows and shades of red used to accent both. It’s more color than Spinning featured, and it helps to solidify the sense of place and space on each page. Walden’s first book, The End Of Summer, features intricately detailed settings at an astonishing scale, and parts of On A Sunbeam feature this same incredible architecture. The limited colors allow Walden’s fantastic linework to take center stage while also setting tone and helping to evoke powerful emotions with bright swirls walled in by black. The two books she published in the interim have been beautiful and remarkable in their own right for different reasons, but The End of Summer and On A Sunbeam share something truly special thanks to Walden’s skill with world-building. Part of what makes that sense of scale so important for On A Sunbeam is that Walden has removed many of the markers that readers would regularly rely on to understand a setting. The story takes place entirely in outer space, so gravitational limitations when it comes to architecture go right out the window. Buildings can be as grand and intricate as she wants them to be, and she lets her imagination take flight, sometimes literally. While the buildings and the fish-shaped spaceships are purely fantastical, Walden sinks her characters’ roots deep, building solid foundations for them to stand on. Girlhood is the universal thread that binds all her work together, and this book is no different. While the main characters are all young adults in the current timeline that is presented to readers, Mia in particular features in a lot of flashbacks as a young teen, falling in love with her classmate, Grace. It’s a gentle and careful telling of a deeply traumatic and cathartic story, which is squarely in Walden’s wheelhouse. Mia’s story unfolds faster than the rest of the cast’s, but their stories are no less important, and are just as well thought-out. There’s real affection between the crew of the spaceship they’re traveling in, and the real frustration that comes with caring about someone when they do things you don’t like. Mia’s transition from girlhood to womanhood is mapped out on the pages of the book, growing slowly and organically through her relationships with the rest of the cast. It’s not immediately evident, but maturity in this world is measured by emotional competence and understanding consent and respect, which is a powerful message to act as the underpinning for an epic love story. There are some points where it’s difficult to tell if the story is meant to be in the present or is part of a flashback, and the pacing stumbles occasionally. The characterization and the imaginative setting make that easy to forgive, especially because Walden neatly avoids many of the criticisms that often come along with a world that’s filled entirely with women by treating it as a statement of fact rather than a question to be answered. It’s unclear if there were ever men to begin with, as all but one of the characters on the page is female and the sole outlier is non-binary. 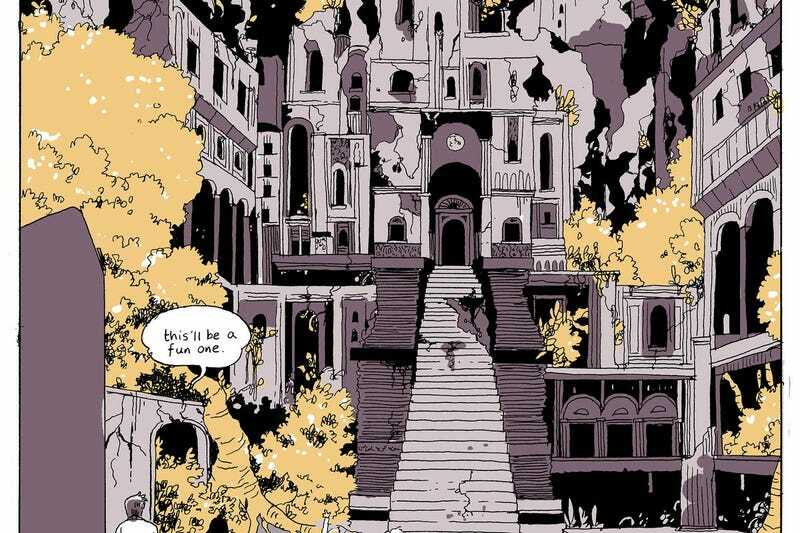 It’s hard to imagine Walden continuing to put out books at the pace she’s had for the past three years, but comics are richer for it, and hopefully there’s many more years to come of her beautiful work.